Chelsea loanee Alvaro Morata was very close to setting the world alight this afternoon, this stunning goal would have counted if the Spaniard hadn’t strayed offside. 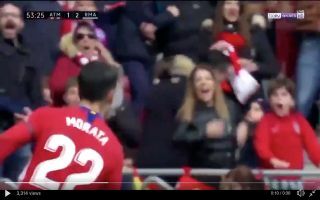 In the 53rd minute of the derby, Atletico defender Jose Maria Gimenez launched a lovely ball over the top which was latched onto by Morata, the forward then produced a rare moment of magic after expertly bringing the ball down by chipping the ball over Thibaut Courtois. VAR was consulted as the 26-year-old was celebrating and the goal was later ruled out for offside, a goal for Morata would have added an amazing storyline to the game, it’s a shame he didn’t stay onside. The hot and cold striker could be one of the only players to have represented both of Madrid’s teams at youth and senior level.